Jack Long spent most of his working-life in the Hanover, New Hampshire area, and the Burlington-Stowe area of Vermont. He attended Bishop Eustace Prep in Pennsauken, New Jersey. He then went to Georgetown University (Wash., D.C.), where he graduated from both the School of Business and the Law Center. Inspired by Georgetown’s tradition of sending many of its graduates into public service, he early on decided that he would attempt to split his careers between the private and public sectors. Currently, Jack is a Financial Industry Regulatory Authority (FINRA) arbitration judge, deciding disputes between investors and their brokerage houses, and disputes between brokerage houses and their employees. 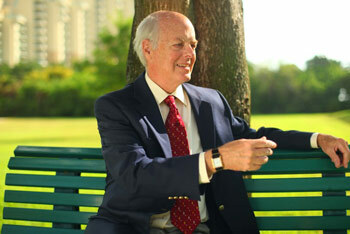 Jack has been certified as a Florida Circuit Civil Mediator. He is a stand-by university Adjunct Professor of International Business Law and Trade, Business Law, and Constitutional Law. He serves on occasion as a substitute teacher at The Palm Beach Day Academy (Palm Beach, FL) and Oxbridge Academy (West Palm Beach, FL). In the public sector, Jack served as Vermont’s Chief Environmental Enforcement Attorney, leading a legal staff with state-wide prosecutorial responsibilities. He subsequently served as the Commissioner of the Vermont Department of Environmental Conservation (having been appointed by Governor Howard Dean, M.D. and confirmed by the Vermont Senate), where he led a staff of 280 professionals. He also served as one of the Commissioners on the Ozone Transport Commission (Wash., D.C.). He has testified about environmental issues before Vermont Legislative committees and committees of the U.S. Senate. In 2007, Jack was recruited by Governor Charlie Crist to serve as the Director of the Southeast District of the Florida Department of Environmental Protection, where he led a staff of 150 professionals, who were responsible for environmental regulatory matters in the five southeast counties of Florida. Jack led the FDEP’s emergency management response in southeast Florida to the BP-Deepwater Horizon Oil Spill. In the private sector, Jack has worked as an accountant and attorney. He is an accomplished litigator, having represented clients accused of environmental violations by state and federal authorities, and insured clients in employment, contaminated sites, and construction-loss / fire-loss cases. He has argued fifteen appellate cases before State supreme courts. He also represented clients before the U.S. District Court for the District of Vermont, and before the U.S. Merit Systems Protection Board. At one point in his career, Jack lived in Manila, ROP, where he worked as the Southeast Asia Regional Director for a U.S.-based trading company. He sat on the Board of Directors of a $1.6B bank holding company. He established and was the CEO of a regional Class-B FM broadcast facility (WJJR-FM) headquartered in Rutland, Vermont, with sales offices in Glens Falls (NY), Rutland (VT), and Hanover (NH). With four other investors, he established (and was the in-house counsel of) a company that manufactured high technology resistance-weld-monitors that were retrofitted onto welding robots. In 1996, Jack became discouraged by the ideas and message of Bernard Sanders, who was Vermont’s Independent Member of the U.S. House of Representatives. Jack ran for Congress, and was the Democrat nominee in the general election. He received the editorial endorsement of the Burlington Free Press, Vermont’s only state-wide newspaper, but lost the general election to the incumbent, who was supported by the Democrat Party. The race received national attention because of the Democrat Party’s refusal to support him, and his One Man Protest March in front of the Democratic Congressional Campaign Committee in Wash., D.C. In 1998, Jack ran in the Republican primary for the U.S. Congress. He again received the editorial endorsement of the Burlington Free Press, but failed to win the primary contest. He describes those two campaign experiences as among the most exhilarating and enlightening experiences of his life. 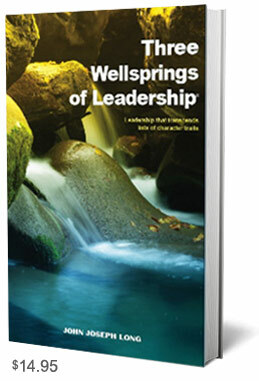 Dissatisfied with the character-traits-list-approach as the accepted way to define character and leaders, Jack wrote a book that examines the “idea” of Leadership, and identifies certain sources of Leadership (Three Wellsprings of Leadership®). Jack has established that many individuals can be authentic and artful leaders, without having to be preoccupied with the latest lists of allegedly indispensable character traits, and the latest leadership fads. One of his by-lines is that “Leaders are poets, not logicians™“. 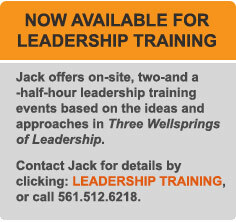 Jack conducts short-form seminars and training sessions in Leadership. And, he is working on a new Leadership book entitled The Leadership Game™.